We often have patients requesting information about the differences between Traditional Liposuction and Laser Assisted Liposuction using SmartLipo Triplex. Like any procedure, they both have advantages and disadvantages. In addition, like any surgical procedure, they each have possible risks and complications associated with them. It is important to understand that the outcome of any surgical procedure is highly influenced by the skills and experience of the surgeon, not only by the technology used. Traditional liposuction is often performed under general anesthesia, which increases the risk of complications and the cost (because of associated anesthesiologist fees.) It also has a much higher risk of contour irregularities (lumps and bumps) and skin laxity (sagging of the skin) when compared to SmartLipo Triplex Liposculpture. One of the most important differences for patients to understand it is that SmartLipo is an extra step added to Liposuction. This means you get the benefits of Traditional Liposuction but by adding new technology you also get the benefits of less bleeding, less bruising, greater skin tightening and a much rapid recovery time. Most importantly, you decrease the risks and complications that are associated with Traditional Liposuction. SmartLipo Triplex liposuction at our center is performed while you are awake, using local tumescent anesthesia, eliminating the risks and costs associated with general anesthesia. Liquefying the fat cells before suctioning them out decreases the risk of contour irregularities. This results in a much smoother skin surface. Bleeding under the skin is decreased by the cauterization of tiny capillaries using the laser. Thus, SmartLipo Triplex gives less bruising and inflammatory changes, therefore less pain, and a faster recovery time. Thermal stimulation of collagen fibers results in decreased skin sagginess and a much tighter appearance of the areas treated by SmartLipo Triplex. Some patients are concerned about burns with use of the SmartLipo Triplex Laser. Even though burns are a possible risk associated with any laser-assisted or ultrasound assisted liposuction procedure, SmartLipo Triplex uses a patented and exclusive technology called the “Thermaguide System.” The Thermaguide is a “thermometer sheath” that surrounds the laser fiber under the skin letting the surgeon know in real time the temperature of the tissues as the laser is treating the areas. The SmartLipo Triplex alerts the surgeon when the desired temperature to melt fat and stimulate collagen has been reached and minimizes the risk of burns or damage to the skin by stopping the laser if the tissues get too warm. In 2002 Dr. Badin published a scientific paper in The Journal of Aesthetic Plastic Surgery titled “Laser Lipolysis: Flaccidity Under Control.” Dr. Badin described the changes that occur under the skin when treated with SmartLipo. The fat cells were destroyed, blood vessels were coagulated and new collagen was produced. He also concluded that these changes under the skin correlated with clinically significant changes, such as decreased size of the areas treated, less blood loss, less bruising and improved skin tightening. In addition, in 2002 Dr. Goldman demonstrated through treating 1,734 patients (313 men, 1421 women) with the SmartLipo Laser system that they obtained less blood loss, less bruising, improved patient comfort and improved fat reduction when compared to Traditional Liposuction *. In 2006, Drs. Kim and Geronemus used MRI to evaluate fat reduction after Laser-Assisted Liposuction and concluded that it results in much greater volume reduction of fat with faster recovery times and significant skin retraction. In 2008, Drs. McBean and Katz studied the SmartLipo system for liposuction. Their research investigated the efficacy of fat cell reduction, the safety of the device and the resulting skin tightening from production of new collagen. After treatment with SmartLipo, they used direct measurement of the areas as well as MRI scanning to conclude that at one and three months there was significant reduction of localized fat cells with no adverse effects, significant skin tightening and new collagen formation. In 2009, Dr. DiBernardo published a remarkable paper in the Aesthetic Surgical Journal titled “Evaluation of Skin Tightening after Laser Assisted Liposuction.” In this paper, Dr. Dibernardo treated half of the abdomen of patients using liposuction alone and the other half of the abdomen with SmartLipo. Then he used photographs and temporary tattoo markings to evaluate the level of skin tightening. He proved that the SmartLipo treated sides had a significantly higher mean skin-tightening ratio. While the sides without SmartLipo treatment showed no significant difference from baseline. As shown above and by many other studies, SmartLipo Triplex Liposuction is simply a tool that, when combined with the experience and skills of your surgeon, offers a far greater advantage over Traditional Liposuction. Not every surgeon is skilled in or has been properly trained to use SmartLipo. This is one of the main reasons why your surgeon may discourage it, they simply do not know enough about it. In all professions, and medicine is not the exception, some people are reluctant to change or to try new advances and technologies. However, when new technology demonstrates far greater efficacy, safety, and better patient results *, we should not be afraid to explore the options. The performance of the SmartLipo product portfolio is driven by more than nine years of clinical study and evidence-based scientific data. For more evidence based studies, please refer to Cynosure’s SmartLipo Triplex page. 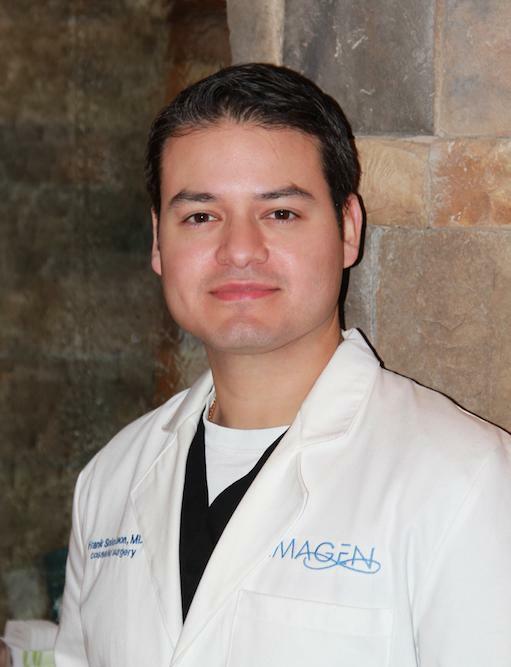 Frank Soto León, MD is a cosmetic surgeon who is board certified through the American Board of Aesthetic Medicine. For more advice from Dr. Soto on body sculpting and other aesthetic treatments please visit www.omahaliposuction.com where you can read his blog and see before and after photos of actual patients. If you have a question you would like to see answered as one of our blogs, let us know! 1. Anderson RR et al. “Selective Photothermolysis of Lipid Rich Tissues: A Free Electron Laser Study.” Laser in Surgery and Medicine. 38:913–919 (2006). 2. Pfelberg DB et al. “Progress Report on Multicenter Study of Laser Assisted Liposuction.” Aesth Plast Surg. 18:259–264, 1994. 3. Badin AZED, Gondek LBE, Garcia MJ, do Valle LC, Flizikowski FBZ, de Noronha L. “Analysis of laser lipolysis effects on human tissue samples obtained from liposuction.” Aesth Plast Surg. 2005;29:281–286. 4. Badin AZED, Morales LM, Gondek L, Chiaratti MG, Canta L. “Laser Lipolysis: Flaccidity Under Control.” Aesth Plast Surg. 2002; 26:335–339. 5. Caplin DA, Perlyn, CA. “Rejuvenation of the Aging Neck: Current Principles, Techniques, and Newer Modifications.” Facial Plast Surg Clin N Am 17 (2009) 589–601. 6. Collawn SS “Skin Tightening with Fractional Lasers, Radiofrequency and SmartLipo.” Annals of Plastic Surgery. Volume 64 Number 5 May 2010. 8. DiBernardo BE, Reyes J. ”Evaluation of Skin Tightening After Laser Assisted Liposuction.” Aesthetic Surgery Journal. October 2009; 29:5: 400–407. 9. Goldman A. “Submental Nd:YAG laser-assisted liposuction.” Laser Surg Med. 2006;38:181-184. 10. Goldman A, Gotkin RH, Sarnoff DS, Prati C, Rossato F. “Cellulite: A New Treatment Approach Combining Subdermal Nd:YAG Laser Lipolysis and Autologous Fat Transplantation.” Aesthetic Surgery Journal. 2008 Vol.28 Number 6: 656–662. 11. Goldman A, Gotkin RH, “Laser-Assisted Liposuction.” Clinical Plastic Surgery. 36(2009) 241–253. 12. Goldman A, Schavelzon DE, Blugerman GS. Laser lipolysis: liposuction using Nd-YAG laser. Rev Soc Cir Plást. Jan/abr 2002;17(1):17–26. 13. Goldman A, Wollina U. Subdermal Nd-YAG laser for axillary hyperhidrosis. Dermatol Surg. 2008;34:1–7. 14. Goldman A, Wollina U “Lipoma treatment with Subdermal Nd:YAG laser treatment.” International Journal of Dermatology. 2009: 48, 1228–1232. 15. Ichikawa K, Miyasaka M, Tanaka R, Tanino R, Mizukami K, Wakaki M. Histologic evaluation of the pulsed Nd:YAG laser for laser lipolysis. Laser Surg Med. 2005;36:43-46. 16. Ichikawa K, Tanino R, Wakaki M. Histologic and photonic evaluation of a pulsed Nd:YAG laser for ablation of subcutaneous adipose tissue. Tokai J Exp Clin Med. 2006;31(4):136–140. 17. Katz B, McBean J. The new laser liposuction for men. Dermatol Ther. 2007;20:448–451. 18. Katz B, McBean J. “Laser-assisted lipolysis: A report on complications.” Journal of Cosmetic and Laser Therapy. 2008;10:231–233. 19. Katz B, McBean J. “A pilot study of the efficacy of a 1064nm and 1320nm sequentially firing Nd:YAG Laser Device for Lipolysis and skin tightening.” Lasers in Surgery and Medicine. 41:779–784 December 2009. 20. Khoury JG, Saluja R, Keel D, Detwiler S, Goldman MP. Histologic evaluation of interstitial lipolysis comparing a 1064, 1320 and 2100 nm laser in an ex vivo model. Laser Surg Med. 2008;40:402–406. 21. Kim KH, Geronemus RG. Laser lipolysis using a novel 1,064 nm Nd:YAG laser. American Society for Dermatologic Surgery, Inc. Blackwell Publishing, 2006. 23. Mordon S, Eymard-Maurin AF, Wassmer B, Ringot J. Histologic evaluation of laser lipolysis: pulsed 1064-nm Nd:YAG laser versus CW 980-nm diode laser. Aesth Surg J. May/June 2007;27(3):263–268. 24. Prado A, Andrades P, Danilla S, Leniz P, Castillo P, Gaete F. A prospective, randomized, double-blind, controlled clinical trial comparing laser-assisted lipoplasty with suction-assisted lipoplasty. Plast Reconstr Surg. Sep 15 2006;118(4):1032–1045. 25. Resko AE, Magro CM, Diktaban T, Sadick NS “Histological Comparison of 1064nm Nd:YAG and 1320nm Nd:YAG Laser Lipolysis Using an ex vivo Model.” Journal of Drugs and Dermatology. Vol.8 Issue 4, April 2009. 26. Saluja R. “Dual Wavelength Laser lipolysis treatment of Lipomas: A Case Report.” Journal of Drugs in Dermatology. April 2010 Volume 9 Issue 4 pg.387. 27. Woodhall KE, Saluja R, Khoury J, Goldman M. “A comparison of three separate clinical studies evaluating the safety and efficacy of laser assisted lipolysis using 1064nm, 1320nm and a combined 1064/1320nm multiplex device.” Lasers in Surgery and Medicine. 41:774–778. December 2009.